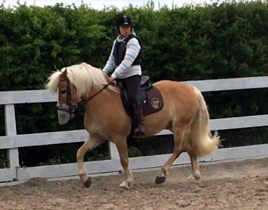 I have owned my Haflinger pony, Crunchie, for many years, but this winter has possibly been the hardest. In September 2016 he became lame, and then to make matters worse, he started with thrush in both back feet. After spending a lot of time off work and being spoilt with plenty hay, he became quite round! By the time I could get back on him, we needed a new saddle. My saddler recommended I try a SMART™ saddle; I tried one and instantly loved it; it’s comfy, lightweight and has helped massively with my position. My Approved Advisor was fab, explaining everything I needed to know about Solution Saddles and why the SMART™ Native GP would be good for Crunchie. The whole process was quick and hassle free. I rave about my new SMART™ Native GP saddle to everyone!